Érdekel az asztrológia? Vagy legalább azt volna jó tudni, mi a csillagjegyed? Angolul is? Kezdd ezzel, ugyanis - lehet, hogy most nagyon meg fogsz lepődni, de - a csillagjegyed angol neve NEM egyezik a hétköznapi állatnevekkel, pl. a bika NEM BULL, a rák NEM CRAB, ahogy az oroszlán SEM LION stb! Csekkold, hogy melyik vagy TE: párosítsd a zodiákus bal oldali oszlopban felsorolt 12 jegyét a jobb oldali oszlop angol megfelelőivel! Az első make-up videó élvezetes vizuális segítséget nyújt, a második - Beyoncé előadásában - pedig megkönnyíti a csillagjegyek KIEJTÉSÉT és memorizálását, én pedig úgy súgtam, hogy a FÖLD JEGYEKET feketével, a LEVEGŐ JEGYEKET szürkével, a TŰZ JEGYEKET pirossal, a VÍZ JEGYEKET pedig kékkel jelöltem. Ezek után már tényleg nagyon könnyű lesz a feladatod! Hajrá! A FELADATOT IDE KATTINTVA INTERAKTÍVAN IS MEGOLDHATOD ONLINE !! Repültél már egyik időzánából egy másikba? (No, it's not a sci-fi movie casting..) Akkor valószínűleg nem ismeretlen számodra a JET LAG jelenség. A következőkben egy olyan cikket alakítottam át TELC Language Elements feladattá, mely e közismert utazóbetegség élettani hátterét mutatja be és hasznos szakértői tippeket ad arra, hogyan minimalizálhatjuk a JET LAG kellemetlen tüneteit. A feladat hagyományosan: az alábbi 15 kifejezés közül csak 10 illik a szövegben elhelyezett GAP-ekbe. Melyek ezek és hova kerülnek? Toddlers who refuse to sleep, adults cranky and hungry at the wrong time and a body clock that has gone haywire. Sound familiar? Yes, that's a long-haul holiday for many people. 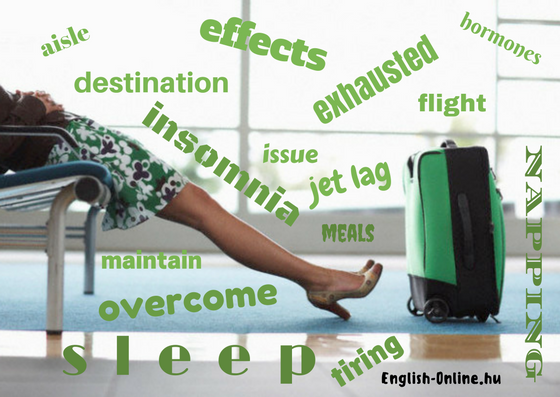 Jet lag is a physical inevitability for most of us when flying long distances, but there are ways to minimise its __________(1). It's all down to eating, sleeping and moving - we are loath to say exercise, because it isn't - so read on. Your body has a natural clock set by the hours of sunlight you are exposed to daily. The light travels deep into your eyes and reaches the pineal gland, which in turn sends messages to __________(2) in your body that tell you when to wake up, when to feel tired, when to eat and even when to go to the toilet. 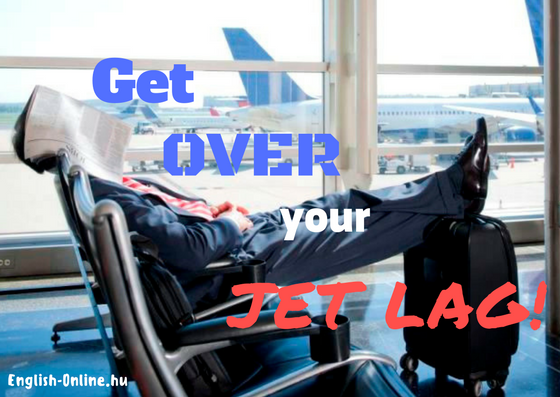 The trouble when you fly is that you are trying to reset this internal body clock quickly and it won't play game. It wants to, but it takes time - an estimated one day per one hour of time difference. In practice, that means it could take the entire two weeks of your holiday to __________(3) a 14-hour time difference, or a week to get over a typical flight to the US East Coast, say. And guess what? Then you have to travel home and go through it all again. We all know the symptoms of __________(4) - fuzzy head, tired during the day, wide awake at night, hungry but never at mealtimes and the sudden desire to go to the toilet at weird times. However, there are some simple things you can do to help reset your your body clock as quickly as possible to minimise these symptoms. Lisa Artis of the Sleep Council stresses that diet, moving and getting out in the sunlight and fresh air are key. "Diet plays a large part in setting your body clock. The day before you fly, make sure you eat three balanced __________(5), including at least five servings of fruit or green vegetables and one portion of protein-rich food, such as white fish or tofu." "Drink plenty of water on your journey and while on holiday to keep your body hydrated and feeling refreshed. Once on the plane, set your watch to the local time of your __________(6). Pack an eye mask and ear plugs and use them if it's nighttime where you're going. Equally keep the light on and mask off if it's daytime in your destination. Whether on your journey there or on your way home, eat according to the mealtimes of the place you're going, avoid alcohol and take regular walks up and down the __________(7)." "Try to get out and about as soon as you can if you land in daylight. Enjoy the sunlight and let it help reset you pineal gland. Also, try to eat at the time of your destination's mealtimes, even if it's only a snack to help reset your digestive tract. Stay active and avoid __________(8) until bedtime - get out and walk in the fresh air. If you arrive and it's nighttime, have a carbohydrate-rich meal, pop two magnesium citrate tablets to help your body rest - magnesium is a natural muscle relaxant - and try to sleep. Don't stress if you can't - simply lie quietly in the dark and gather your thoughts; try to relax and enjoy the quiet." "During your break away, __________(9) a healthy diet to help control your wakefulness: high protein meals increase your alertness while lots of carbohydrates make you feel sleepier. If you can, take your pillow with you for some familiarity and comfort. For less exotic destinations, the problems are more likely to be about comfort than jet lag. An eye mask and ear plugs will help you sleep if noise or light outside is an __________(10). Keep your bed as a sleep zone and check the temperature. Ensure you keep the bedroom cool -the ideal sleeping environment is 16-18 °C." Hogy tetszett a TELC ÍRÁSBELI feladat? Watch and listen to the INFORMATIVE VIDEO about Boris Bikes by Oxford University Press and mark the sentences (below) TRUE (T) or FALSE (F). 1. Jack drives in London for pleasure. 2. Parking in London is nearly as expensive as petrol. 3. Jack usually gets around the city by bike. 4. The Tube is the oldest and cheapest way of public transport in the capital. 5. Cycle hire has been the healthiest alternative to public transport since 2010. 6. Boris Bikes was named after a politician. 7. Boris Bikes is completely free. 8. 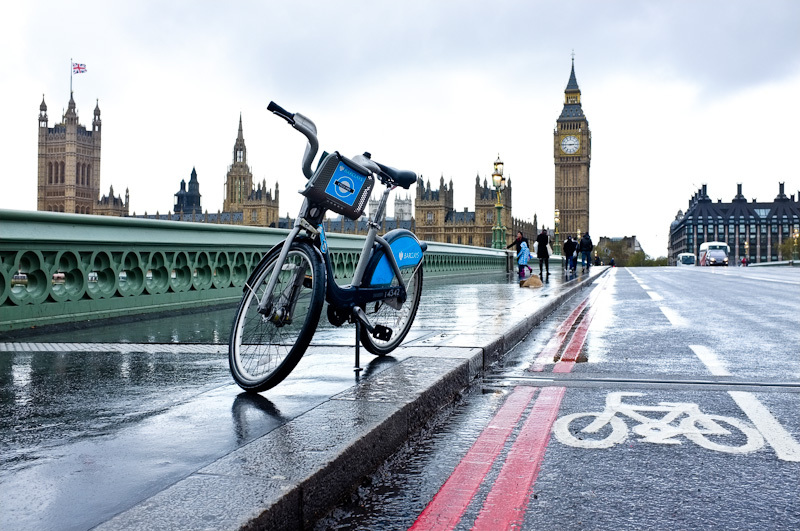 Bike sharing is only popular with visitors to London. 9. Since the 1960s more than 156 bike schemes have been introduced in the world. 10. The bike scheme in Barcelona is called ’bixi’. 11. The biggest bike sharing system is in China. 12. London is the most bike-friendly city in Europe. 13. In the UK there are separate bike lanes everywhere. 14. It isn’t allowed to cycle on the pavements in London. 15. You must wear a helmet and bright coloured clothes while you’re riding. 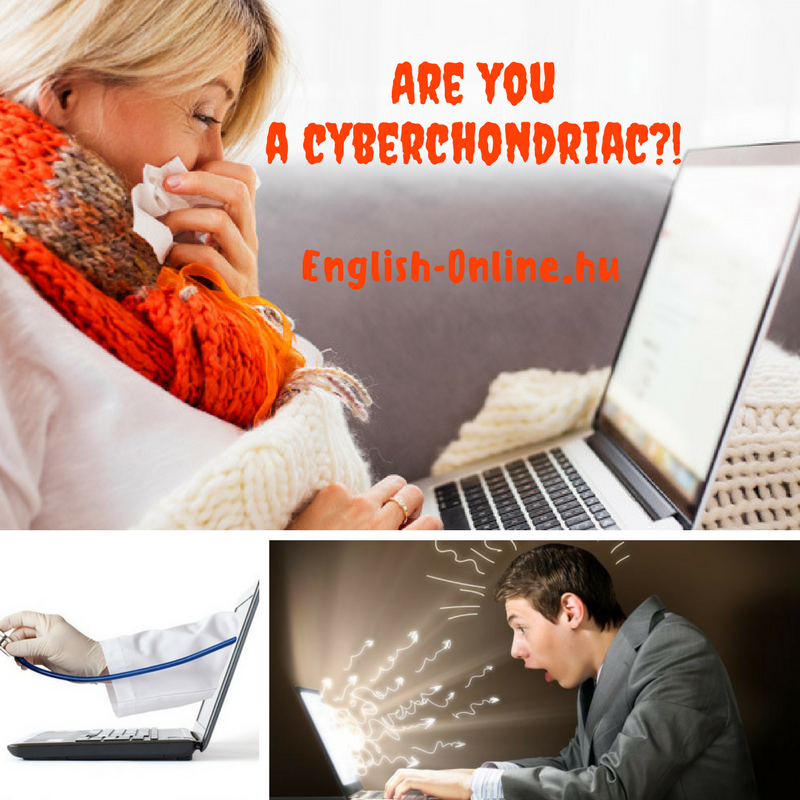 Hajlamos vagy a hipochondriára? Van interneted? Innen már csak egy lépés a netochondria vagy kiberchondria! Olvasd el angolul, milyen veszélyeket rejt magában az, ha megbetegedéseid alkalmával inkább kigooglizod a tüneteidet és orvosi vélemény nélkül öndiagnózisokat állítasz fel. A hasznos olvasmány mellé méghasznosabb feladat társul: helyezd vissza a cikk végén felsorolt egészség/betegség szókincs elemeit (20 db) a szövegbe! With GP __________(1) busier than ever, many people are choosing to search the internet for answers to a health worry, or to try to self-diagnose. Evern Health Secretary Jeremy Hunt has suggested parents search online to determine the severity of their children's rash. But, as Dr Ellie Cannon explains, googling __________(2) has its dangers. 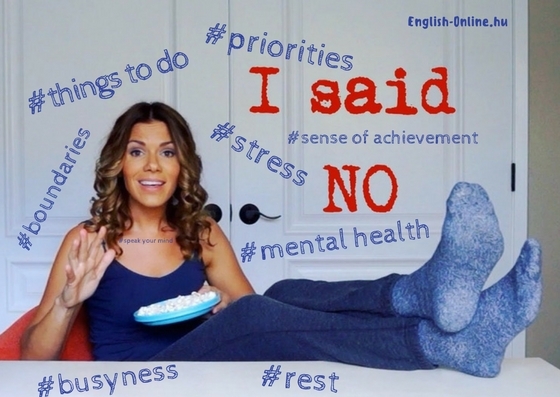 When we make a __________(3), it is about a lot more than your list of symptoms. You'll notice a GP often asks about your job, your relationships or even what you have been eating. You need that whole story to make a proper __________(4) assessment, and Google just can't see that big picture. This often leads to a wrong answer which can be dangerous if a serious diagnosis is missed. Google gives you all the weird and sinister possible diagnoses, as well as the most likely common ones that I see every day in my __________(6). It is human nature to look at those strange possibilities and start to worry you have some very rare, serious illness. Symtom checkers tend to provide vast unrealistic lists of __________(7), most often including the word 'cancer' which, of course, gives people huge amounts of unneccesary worry. As well as worry, googling medical complaints can lead to disappointment. Many websites suggest __________(8) that is not appropriate: US-based sites may recommend pricey experimental treatments that are not available or recommended in the UK. Alternative medicine sites can offer __________(9) that are unproven and come with a heavy price tag. Even genuine medical sites may offer out-of-date advice. It's good to see someone. Whether it's a __________(10) or a GP, there is no substitute for interaction with a real-life healthcare professional. You can't diagnose a __________(11) by trying to match a picture on Google - when doctors __________(12) you they're looking for your general well-being and appearance, and how distressed you are. A quick online check cannot match that universal view. The online world, as we know, can be different to reality, and this is very true for health information, which can be fake or inaccurate. Many sites appear to be written or endorsed by a __________(13) when they aren't - anyone can put a picture of a __________(14) on their blog and fool people into believing it is a genuine medical site. This can be misleading and unsafe. But it's not all bad. There are some fabulous __________(15) resources online if you look at the right sites. NHS Choices and NetDoctor offer up-to-date medical information written by UK doctors whose advice you know you can trust. They are good places to read about your diagnosis once you have been to your __________(16) to give you a broader view of your __________(17) and treatment. If you suffer with a __________(18) or something slightly unusual, an online community can be really valuable. Charities such as the National Eczema Society provide online support and fantastic information, with tips from other sufferers - a great __________(19) of advice and comfort. For rarer __________(20), online communities offer support and information that would not otherwise be readily available. Hogy tetszett a cikk és a szókincsgyakorlat? Olvasd el a cikket és oldd meg a szöveg végén az IGAZ/HAMIS állításos feladatot. Ha a szöveg szerint a mondat helyes, TRUE-val jelöld, ha nem, FALSE-ként értékeld. A NAPÉGÉSSEL KAPCSOLATOS segítő SZÓSZEDETet narancssárgával szedve találod a feladat alatt. Roughly a fifth of Britons regularly go out on even the hottest and sunniest days of the year without sunscreen. Given that, it is hardly surprising that a recent survey by Nivea found that around 80 per cent of us have been sunburnt in the past. Yet quiz the same people about the negative effects of sun exposure and they are likely to be able to list them. It is certainly no secret that spending too much time in the sun causes premature ageing, not to mention the danger sunburn presents to long-term health. Rates of malignant melanoma - the deadliest form of skin cancer - are disproportionately high in younger people and the disease is almost twice as common in young women as it is in similarly aged men. "Sunburn is an acute reaction in the skin that follows excessive overexposure to ultraviolet (UV) radiation. It causes direct damage to DNA, resulting in inflammation and death of skin cells," explains consultant dermatologist and British Skin Foundation spokesperson Dr Anjali Mahto. "The risk is higher in equatorial areas or at altitude , particularly in those with fair skin types. Sunburn in childhood or adolescence can double the risk of developing melanoma in later life. Keeping yourself safe is simple, however. Dermatologist Dr Stefanie Williams, founder and medical director at private clinic European Dermatology London, has some straight-talking advice for preventing sunburn. "If you are serious about keeping your skin in top shape, sunscreen should be worn on a daily basis, even here in the UK," she says. "While you might not get sunburnt, your skin can still be exposed to significant amounts of UVA without even noticing. Used regularly, sunscreen even allows the skin to repair some of the existing damage. "In a hot climate you must reapply every two hours and always apply liberally. For the best defence, I recommend a broad-spectrum protection with SPF (UVB) 30-50 and high UVA protection, plus sun avoidance, of course. 1. C - COVER UP: Wear a T-shirt, hat and sunglasses. 2. A - AIM FOR SHADE: Stay out of the sun between the hours of 11am to 3pm in the UK. 3. R - RUB ON SUNSCREEN: Use plenty, with at least an SPF15 and a 4-star rating. 4. E - ENJOY: Have fun in the sun safely. 1. POP A PILL: "Painkillers can help relieve the pain and reduce inflammation caused by sunburn. Nonsteroidal anti-inflammatory drugs such as ibuprofen are ideal and should be continued for a period of at least 48 hours if there are no contraindications. Paracetamol will help with pain, but has little effect on inflammation." 2. COOL DOWN: "Apply a cool compress to the skin - you could try a towel dampened with cool water - for fifteen minutes. Or take a cool bath or shower. Aim to keep the temperature just below lukewarm and make sure the shower has a gentle flow of water, rather than being on full power. If blisters are starting to develop the a bath is preferable to a shower. Do not rub your skin with a towel; instead gently pat it dry when you get out. 3. SOOTHE YOUR SKIN: "After a bath or shower, use an unperfumed cream or lotion to soothe the skin. Repeated applications are necessary to reduce the appearance of peeling and you may need to continue repeat applications for several weeks. Aloe vera is a good choice; it not only has a cooling effect on the skin but also acts as an anti-inflammatory." 4. TRY A STEROID CREAM: "Using a weak steroid cream such as 0.5-1 per cent hydrocortisone for 48 hours may decrease pain and swelling caused by sunburn and speed up the healing process. This is best avoided in small children, however." 5. DO NOT POP: "Leave blisters alone. Try not to pop them, as this can lead to infection and scarring. They will settle by themselves after a few days. In the meantime, treat the skin gently. READ THE ARTICLE AGAIN AND THEN MARK THE STATEMENTS BELOW TRUE OR FALSE. You can use the GLOSSARY under the statements to help you. 1. British people are not at risk of getting sunburnt. 2. People in Britain get sunburnt because they don't know about the harmful effects of sunlight. 3. The worst type of skin cancer is more frequent among women than men. 4. Malignant melanoma occurs at young age. 5. Getting sunburnt is more likely if you have lighter skin. 6. It is only necessary to put on sunscreen when the sun is shining. 7. In the acronym CARE the letters stand for Cream to Avoid Radiation Exposure. 8. In hot climate you have to apply sunscreen twice a day. 9. In case you start having blisters, it is best to have a cold bath. 10. You must never pop your blisters or else they will still be visible after healing.